Western blot analysis of extracts from COS cells, untransfected or transfected with mouse angiopoietin-2, using Angiopoietin-2 Antibody. 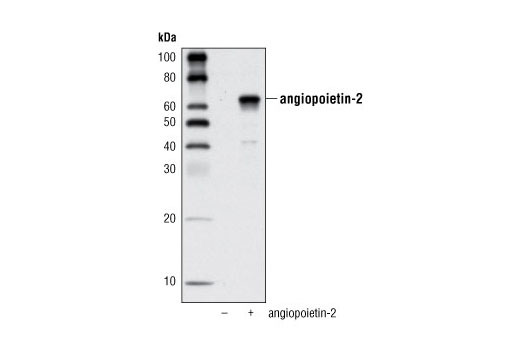 Angiopoietin-2 Antibody detects transfected levels of mouse angiopoietin-2 protein. Polyclonal antibodies are produced by immunizing animals with a synthetic peptide corresponding to residues surrounding Lys275 of mouse angiopoietin-2. Antibodies are purified by peptide affinity chromatography. Angiopoietins are a family of Tie receptor ligands. There are four angiopoietins discovered so far: angiopoietins 1, 2, 3 and 4 (Ang1, 2, 3, and 4) (1-3). Ang1 binds to the Tie-2 receptor and leads to its autophosphorylation and subsequent activation of downstream signaling pathways. It plays an important role in blood vessel formation, maturation and subsequent stabilization (1,4,5). Ang2 is an endothelium-specific growth factor that functions as an antagonist to Ang1, promotes vascular associated proinflammatory function, destabilizes quiescent endothelium, leads to vascular leakage and vascular destablization and remodeling (2,6,7). Ang2 is selectively expressed in many tumor tissues where, combined with other growth factors such as VEGF, it can promote vascular remodeling, angiogenesis and inflammation (7-9). Davis, S. et al. (1996) Cell 87, 1161-9. Maisonpierre, P.C. et al. (1997) Science 277, 55-60. Valenzuela, D.M. et al. (1999) Proc Natl Acad Sci USA 96, 1904-9. Suri, C. et al. (1996) Cell 87, 1171-80. Thurston, G. et al. (1999) Science 286, 2511-4. Gale, N.W. et al. (2002) Dev Cell 3, 411-23. Fiedler, U. et al. (2006) Nat Med 12, 235-9. Tait, C.R. and Jones, P.F. (2004) J Pathol 204, 1-10. Tsutsui, S. et al. (2006) Breast Cancer Res Treat 98, 261-6.